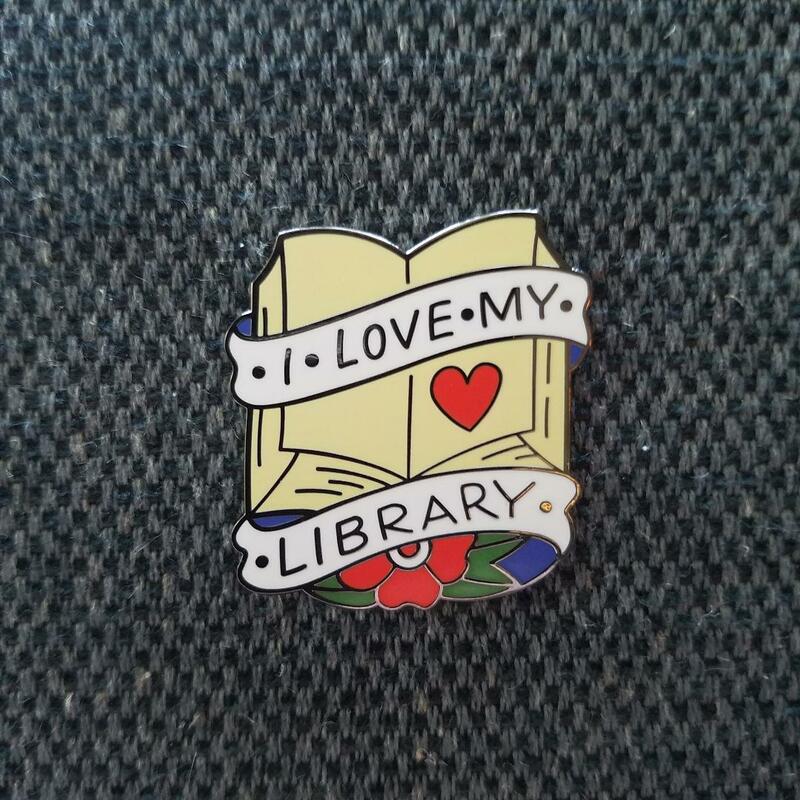 Purchase an I Love My Library Pin today to show off your support for libraries and to help us fight for libraries across the United States. While we're sold out here, you can still receive one of these great pins here by starting a monthly donation of $1, $3, $5 or more per month. And, thanks to a generous donation from ByWater Solutions, your first month of donations will be matched! Once again, we are excited to work with artist Levi Greenacres and librarian Muriel Wheatley to bring back another limited run of last year's very popular enamel lapel pins. Last year these pins sold out in just a few days so don't wait to make your purchase or you'll miss out! Order as many as you like for $15 each here on this page. Receive a pin for starting at least a $1, $3, $5, monthly donation as part of Bywater Solutions Matching Donor Drive here. These high quality enamel pins can be worn to show off that you support your local library. They make great gifts for library staff or library staff can wear them to show off their support for libraries when they're out in the community or at the desk. They also make great giveaways and prizes for library supporters and advocates. So don't wait! Get yours today. Libraries mean a lot to me, and to my amazing partner Muriel, who is a librarian. We wanted to do our part to help raise money for an important non-profit that helps inform voters on how to take political action at a local level to keep libraries open across the country. Your purchase of these pins will help us support libraries across the country. In fact, by supporting the only national Political Action Committee for libraries in the United States, you can feel good that you're part of the solution to ensuring that libraries remain well-funded and able to provide their communities with the services, programs, and collections that Americans deserve. Through your donations, we’ve been able to help libraries earn over $1.6 billion dollars in funding in the last 6 years. Our history of success is significant and for every dollar that we’ve raised, we’ve helped libraries earn about $1,600 in stable funding. That means that for for every $1,000 in donations that we've received, we have able to help libraries earn over $1.6 million dollars in stable yearly library funding. That's enough to hire more than 20 librarians with every $1,000 investment. Let me know when you have pins available…I may need many.